A screw extractor has reverse threads made of hardened steel. Screw heads, especially the ones with a single slot for a flat screwdriver, are not as tough as they appear. It's easy to strip a head when driving a screw and even to do it easier when trying to remove one that has rusted in place. There are techniques to avoid this, but once it happens, you've got a problem. How do you turn a screw with no slot for the screwdriver to grip? Enter the screw extractor. This tool is for emergencies. It can save you from having to chip out the wood around a stuck screw so you can grip it with pliers, and it may be your last resort for separating metal pieces fastened by that single screw you can't budge any other way. There should be one in every toolbox. What Is a Screw Extractor? Screw extractors often come in kits that include several different sizes. 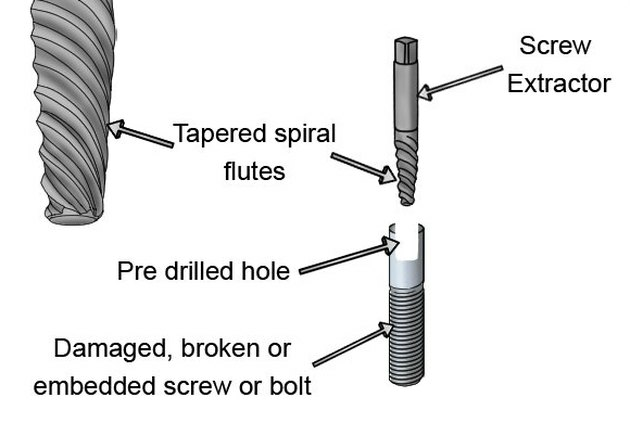 At first glance, a screw extractor looks like a conventional drill bit, but look closer and you'll see that the spiral flutes are closer together, and—most important—they run in the reverse direction to those on a boring bit. 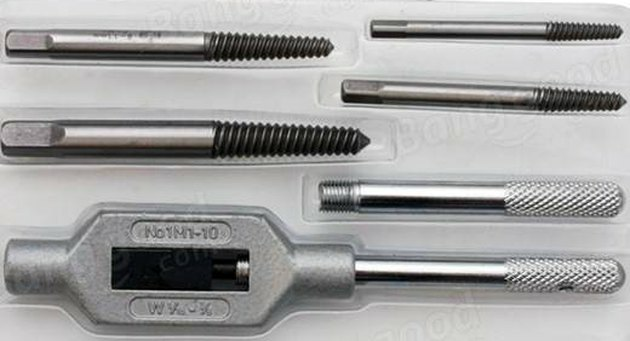 The screw extractor is also beefier, and it has a square head suitable for gripping with a socket wrench. It comes in several sizes to handle a variety of different-sized screws, and it's forged from chrome-vanadium steel or some other equally hard material. The tip of the screw extractor is pointed and its overall shape is conical. When you tap the extractor into a pre-drilled hole in the screw head, the flutes bite into the metal and grip it. Since the flutes spiral counterclockwise, turning the extractor in that direction causes them to bite even deeper while at the same time turning the screw in the direction it needs to back out of the workpiece. You generally need to pre-drill a hole for the screw extractor. The basic procedure for removing a screw is to pound the screw extractor into the head of the screw until the flutes bite, then using a wrench or drill to turn the extractor counterclockwise. 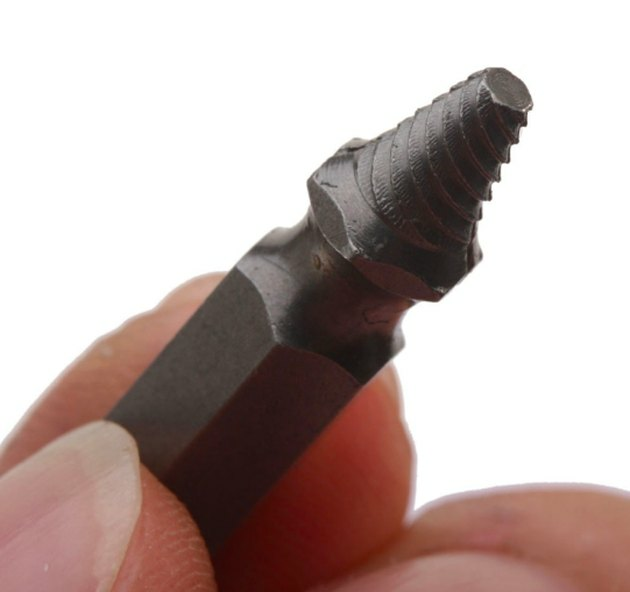 You usually need to drill a 1/8-inch-deep hole into the screw to give the extractor something to grip, but not always. You can sometimes extract a stripped Phillips or Robertson screw by just tapping the point of the extractor into the stripped screwdriver slot. Screw extractor kits often come with a bar handle to give you leverage to turn the extractor. However, inserting the extractor into a drill and running the drill in reverse is almost always easier and more efficient, because you can put downward force on the drill while it's turning. This helps the extractor bit deeper into the metal and prevents it from slipping. However, it's better to use the bar when extracting larger screws from metal. If the screw is rusted, the head may break off when you're trying to extract it. That usually doesn't present a problem, although you may have to widen the screw hole with a larger bit so you can drill a new pilot hole in the screw shank and force the extractor it. When a screw is rusted in place, it's a good idea to douse it liberally with lubricating fluid and wait 10 or 20 minutes before extracting it. While you don't always need a screw extractor to remove a stripped screw, you'll be glad you have on in your toolbox when nothing else seems to work.